Lauren Gallagher and L. A. Witt: To Live Again - Oops. To Live Again - Oops. So I have a new release today, and I get to facepalm like crazy because I made an error that I didn't notice until some reviews mentioned it. And I figured, well, the best thing to do was just to own it. What happened? I wrote the book. I wrote the blurb. I edited the book. I edited the blurb. Those steps happened far enough apart (and with other books/blurbs in the interim) that I made a pretty glaring oversight. Namely, the blurb says Sailo and Greg have a twenty-year age gap, but in the book, it's ten years. Originally, they were twenty years apart, but I changed it in the book...and completely overlooked the blurb. Yep. I screwed up. And by the time I noticed it, the book was out, in print, etc. Sooooooo egg on mah author face. The publisher has been notified, and hopefully we can get the blurb tweaked on future editions, but there's no point in pretending the error isn't out there now or that it's anyone's fault but mine. 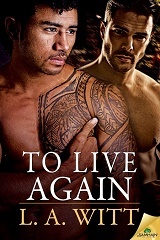 With that being said, TO LIVE AGAIN is now available from Samhain! Warning: Contains an older guy who’s waited half his life for this, a younger guy who didn’t realize how lonely he was, and some very hot visits to the upstairs VIP lounge at Wilde’s. Author is not responsible for readers who can no longer look at a leather booth the same way again.